When I work with the health and well being of a client, it is the start of them understanding the framework of what is often quite a profound and authentic way of living their life. Mostly I am teaching laws, the laws of nature to be precise that give good health and how to work within them. These natural laws are not complicated, they are often just common wisdom, common sense, the same wisdom I received when I was ill and had lost my way. The common sense we used to live by but our modern ways shun. More often than not we know what we should be doing, in our hearts we keep telling ourselves we should be doing this or that, but we stay drawn to the habits that define us. So it often takes someone else to confirm or agree that their intuition is right. That what they knew in their hearts is the path that they should be following. Given space and time to listen and for someone else to help highlight these aspects of life are enlightening, and empowering. This wisdom is just on how best to nourish yourself, nourishment is about self care, and the actions that you need to take to feel truly nourished. When did a ready meal leave you nourished? 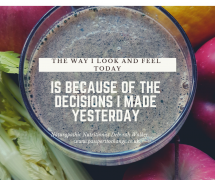 When did your life style choices leave you nourished? Did that glass of wine and the interaction with your phone make your heart sing? Natures laws are a framework that keeps us well, and happy. They are simple, how are you breathing? How are you eating? When are you eating? What are you eating? How are you living? How are you eliminating? How are you relaxing and recuperating? How are you exercising? Did you get out into the light today? How are you sleeping? These aspects of health need to optimised in a way that makes us healthy, and we more often than not know when we are living outside of them but don’t act quickly enough. Pushing ourselves into a state of exhaustion and ill health that becomes hard to turn around and leading us to more chronic disease states and acute issues that take forever to heal. Prevention is the name of the game, this takes time and effort, that quick fix has to be put aside for the long term change that you know will make the biggest difference to your life. This means that you have to take responsibility for your health, and accept that only you can truly get yourself well through your own actions. You have to treat the whole, not the symptom, and this takes time and an understanding of that. Listening is the most important skill you can ever learn, listening to your body will give you all the information that you will ever need to be healthy and more importantly remain healthy. The body is capable of healing itself, if you ever doubt this talk to a doctor who deals with broken bones, their ability to regenerate is profound, the bones not the doctor! 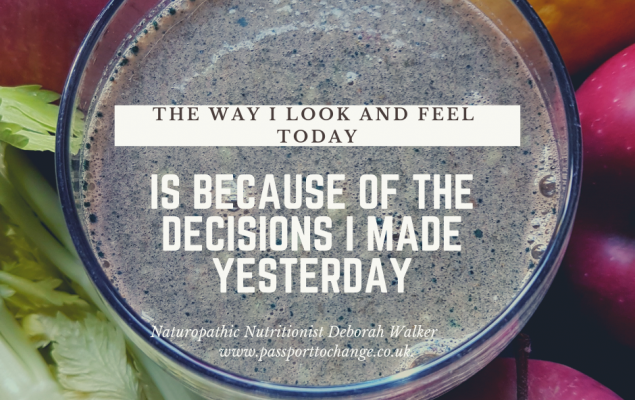 As a naturopathic nutritionist I was trained to be an educator, my role is to educate my client so that they can take control of their own health. When the client learns how they can help themselves, in some respects there is no looking back for them, and my role is a guide for when the client isn’t sure of the next steps often preventing them from in the words of a client… chucking everything and the kitchen sink at the issue! The aim of change is to optimise and preserve the quality of life that so many people lose when they become ill, there is nothing worse than not having good health, and you don’t realise what you have until you don’t have it. So the aim is to keep your health good all the time with what you are doing, enabling the body to continue the regeneration process that keeping to those natural laws enables you to do. When you work within nature with your remedies, diet, exercise, breathing and supplementation you are working in a supportive nature, supporting the body to do it’s job, you are not taking away that ability or blocking it. When we are ill is when more often than not we are forced to create radical changes, and it shines a light on the things that we are doing, and potentially how it’s affecting us. Mostly in our society we only pay attention to the symptoms that are giving us the most pain. Asking can you take this pain away as quickly as possible, but this is a deep rooted issue that needs more than a sticking plaster approach which in more cases than not is what we do. We do this not only with allopathic medicine but also with natural medicine. Everyone wants to have the pain removed as quickly as possible, few people want to put the time and effort into truly allowing healing at a deeper level to happen. Deeper level healing takes time, effort and often a lot of soul searching, going into places that we know are painful. So we avoid it, and just take the quick route. But all we are doing is kicking the can down the road to a point which is likely to be more painful and difficult to resolve. Disease doesn’t just enter the body and make us sick, no matter how much we may want to believe this it just isn’t the case. We don’t become stricken with illness, we are not innocent in this, and mostly it isn’t because we’ve had bad luck. We may shake our head and think every year I’m getting this and it’s getting worse, every month I feel like this and it just won’t stop. Until we change our lifestyles and live within natures laws in a way that fits with your health it isn’t going to stop. We don’t fall ill, we don’t catch an illness. We have an inner terrain and that terrain is becoming more well known in science now than ever, our internal cellular environment influences how healthy we are. The intra and extracellular fluids make up 70% of the body’s weight, and this environment provides the body with conditions that are either supportive of good or bad health depending on what we are doing. The cells depend on the delivery of nutrients, vitamins, minerals, water and oxygen, they also need to eliminate effectively. If we are eating foods that are not nourishing us, we are polluting this fluid, because the environment of the cell matters, it’s like your kitchen bin if you don’t empty it, it’s not going to be a great place to go to, it’s going to smell, ferment, and not look great! The body strives to keep you in balance, and therefore your health depending on what you are doing is always in the balance. When the terrain is overloaded on a regular basis because we are creatures of habit and tend to do the same things over and over, and are often told those things are healthy to do, the body struggles to keep you in that balance and to restore itself. We accumulate wastes and when we are collecting our waste in our tissues because they can no longer get out of the body, the congested body is unable to carry out it’s activities as easily as it once could. Someone recently told me how at their age that they know it’s harder to lose weight and to recover, they were 4 months older than me. Age is not a factor, but of course timescale of not nourishing yourself or looking after yourself is, ignoring the signs for too long is, not listening is. Constrict the body’s ability to function at cellular level and you have illness, this is the same for all disease, it doesn’t really matter to me what disease state arrives at my door, and often people will ask me can I deal with specific issues. They all derive from the same cellular state, the illness hasn’t entered the body, we have created the conditions in the body for that imbalance to happen. The terrain of the body has been placed into such a poor condition that an illness has manifested. So the questions should be where is the obstruction in the body that could be causing this? Why has the body become overloaded with it’s metabolic wastes to create this? Illness manifests itself in so many ways, and it will be different for each of you. Understanding that your health is in your hands is empowering, it’s your terrain that is affected by your decisions of what you do with your health, what you eat, drink and think, and how you choose to live your life. If you eat more than you need to eat the body will store it, if you eat foods that it can’t metabolise it will store it, nature isn’t used to additives or preservatives which our foods are now rich with, it’s also not used to such calorie dense and nutritionally poor foods. The accumulation of waste in the body happens with even stress and anxiety, something our society is now rife with. When our stress levels affect our digestion, this leads to more waste being accumulated. Becoming overloaded with our waste due to our inability to breakdown our foods properly or even not being able to utilise our foods fully leads to deterioration. With nutritionally deficient foods we are creating nutritional deficits which then hold back the body from working effectively. In effect we are poisoning ourselves, rather than listening and nourishing ourselves. I’m often told I’m a fanatic, a health freak and taking it all too seriously, mostly I’m told this by people who are ill, tired, and lacking in vitality, but it’s important to be vigilant to what you are doing to your body because it’s easy to stop being disease resistant! Alexis Carrel Nobel Prize winner for medicine stated “The body is ill in it’s entirety. No illness remains strictly confined to a single organ”.